As of October 1, 2014 red light cameras in the City of St. Petersburg Florida have been turned off! Thank you to the members of the City Council who voted to kill the program, and to the Mayor's office for coordinating a controlled end to the program. This website was created to display all of the information available about Red Light Cameras(RLCs) in one place. After several months of searching for studies and reports on the real-world effects of RLCs, and analyzing all of those studies and reports, our analysis shows that RLCs lead to a significant increase in crashes and injuries. Because of this, we believe that RLCs are not a good idea and should be deactivated in St Petersburg, Florida. If safety is the true motivator behind the city's use of red-light cameras, then maybe they should consider the much more effective alternatives. Don't just take our word for it, Click here to see all of the RLC studies and reports we could find (both for and against) and judge for yourself! 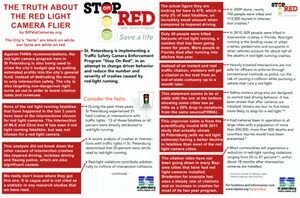 Red Light Cameras in the news - UPDATED DAILY!